Hindu pantheism and its rich cultural elements are best showcased in the temples with its architectural splendor invoking an ancient heritage. Tamil Nadu is a land of temples and a foreigner visiting the state usually gets puzzled over these quaint, high rise structures with many statutes of deities and filigree carvings decked up on these towers. For the devout interested in seeing all the major temples at one-go, TTDC has arranged special packages in which one can visit these ancient shrines leisurely and have darshan of his or her favourite deity. Even those residing in the state for long, set aside time each year to go on a pilgrimage to temples as a spiritual rejuvenation. Until about 700 A.D., temples were scooped out of caves. The Pallava kings (till 900 A.D.) carved out giant monuments out of rocks in mountains. 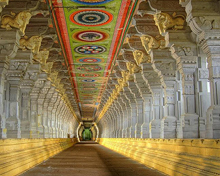 During the Cholas (900-1250 A.D.), many towering gopurams were built with decorative mandapams (or halls) to temples. The Brihadeeswarar temple in Thanjavur built by Raja Raja Chola-I bears testimony to the craftsmanship of those times. In the period of Pandyas (up to 1350 A.D.), huge towers with high wall enclosures and towered gateway began to appear in temples. Noted for fine intricacy, Vijayanagar style of architecture (1350-1560 A.D.) has a number of decorated monolithic pillars and the Naiks (1600-1750 A.D.) added large prakarams (circumambulatory paths) and pillared halls. Kulasekar Pandyan built the original temple. But it was ruined and a new plan was drawn by Viswanath Nair. The new temple (present one) was completed by Thirumalai Nayakar. There are 12 mammoth gopurams forming a protective layer over the temple. 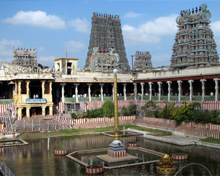 The lotus pond is located to the left of Meenakshi deity. While Sundareswarar gives darshan in the form of a linga. One of the largest temples in India, this was built by King Raja Raja Chola-I (also known as big temple). This magnificent edifice is part of Unesco’s World Heritage site known as the “Great Living Chola Temples”. These are a set of nine temples each representing a planet in our solar system. 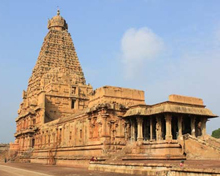 As Hindus believe in astrology and the movement of planets in their orbits which may affect their lives, a visit to these shrines located between Kumbakonam and Thanjavur. The patron god of Tamils, are temples that attract millions of Tamil diaspora from across the world. They are located in Palani, Swamimalai, Tiruchendur, Tirupparankundram, Tiruttani and Pazhamudhircholai. Here Lord Ganesha sits on a temple built on a huge rock in Trichy. Apart from drawing pilgrims from rest of the state, the locals climb the stairs and pray to God for fulfillment of vows and goals in life. Kumbakonam temples: This small town is replete with Saivite and Vaishnavite temples each having a legacy of its own. Dedicated to Lord Shiva, this ancient temple has two main lingams at the sanctum – one moulded by Goddess Sita from sand considered as main deity called Ramalingam. The other one brought by Lord Hanuman from Mount Kailash called Vishwalingam. According to Lord Ram, Vishwalingam must be worshipped first as it was brought by Lord Hanuman. She is the sentinel at the southernmost tip of India where the confluence of three seas takes place. The goddess is in the form of an adolescent girl called Shree Bhagavathy. According to legend, Sage Parasurama has consecrated the temple. In Chennai alone, there are numerous temples – Kapaleeswarar temple, Mylapore; Parthasarathy temple, Triplicane; and Palani Andavar temple, Vadapalani, to name just a few – which get steady patronage by the locals and domestic tourists. While Kancheepuram occupies a pride of place in TN being the birth place of DMK founder Annadurai, it also boasts of temples that are being patronised by Saivite, Vaishnavite devotees over centuries. 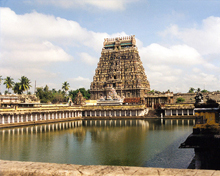 Likewise, Nataraja temple in Chidambaram is devoted to Lord Shiva and gets year-long visitors from all over India.